Featured Product: Bavarian End Cut Oak | Nor-Cal Floor Design, Inc. 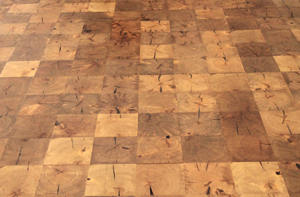 This unique floor is available in custom sizes, with the typical square size (end cut’s) being 6” x 6”. It is engineered, which creates a much more stable plank over its solid alternative. The greater the stability, the less likely for cupping and warping to occur. It comes in planks of 4 to 5 squares which creates for a much easier and uniform installation. A custom finish can be applied to achieve the desired color tone.